Benefit Cosmetics bronzers are some of the best on the market. If you're any sort of makeup junkie, we know you are familiar with their ever-so-popular Hoola Bronzer. Or if you are like me, it's less like a familiarity and more like a habit where you take it with you absolutely everywhere. So when news broke of Benefit's new formula for this staple beauty product, we were pretty ecstatic. 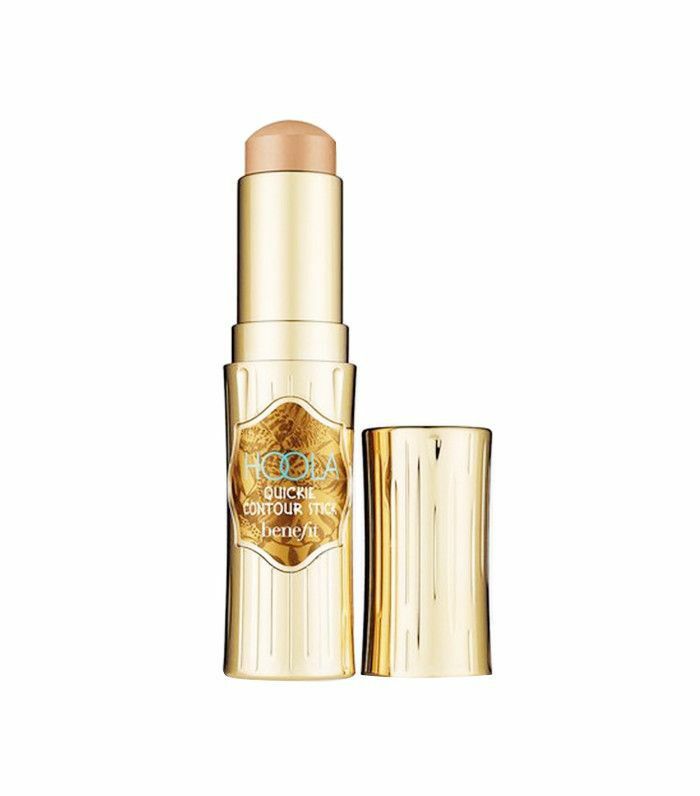 It's official: The brand has released the newest addition to the Hoola family in the form of its Quickie Cream-to-Powder Contour Stick. The formula makes contouring quick and effortless by giving you a targeted application and a product that's extremely easy to blend (yay for creams!). Then, it transforms into a non-drying powder that provides super-long wear. Even if you're slightly tired of contouring (or never learned to master it in the first place), this combo of easy application and staying power might just put contouring back on your radar. Keep in mind that the new stick is the same warm, glowy shade as the Hoola powder bronzer, so we recommend it for light to medium complexions. Unsure how to use Benefit's new contour stick? Keep scrolling to see three easy-to-do looks. For this subtle contoured look, swipe the stick onto the hollows of your cheekbones and blend upward with your fingertips, or use a dense brush such as the Real Techniques Expert Face Brush ($7). For a bronzier finish, swipe the contour stick directly down your cheekbone and blend. Make sure to blend until any harsh lines are diminished. Cream contour sticks can also be used to sculpt other areas of the face such as the nose, chin, and forehead. For a naturally sculpted look like this, apply the bronzer to your cheekbones and to the outer edges of your nose for a slimmer, more defined shape. Blend until you can only see a slight shadow on the nose. Want to read about more product launches? Check out nine new Sephora products to obsess over right now.